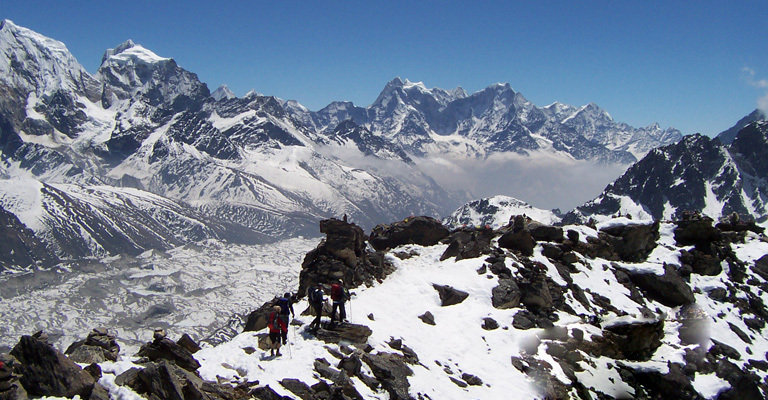 A fantastic trek that offers a good alternative route to the traditional base camp in the Khumbu valley with plenty of time at Gokyo to explore the wild beauty of the less populated area. Additional day trips and high altitude walking including the crossing of Chola Pass can also be tailored as per interest and timeframe of the clients. This trek offers the best of the mountain scenery including the view point of Kala Patthar (5,545m) where you can see more than 30 of the highest mountains along with Mt. Everest, Everest Base Camp and the cracking glacier. An incomparable blend of ancient Buddhist monasteries, serene Sherpa villages, rushing snow-fed river and sequences of the most beautiful panorama of the surrounding Himalayan Peaks are the highlights of this trek. Day 09: Gokyo - excursion Gokyo Ri (5360m) 02:00hrs. Day 10: Gokyo Ri - Thangnak (4690m) 05:00hrs. Day 11: Thangnak - Cho La pass (5330m) - Lobuche (4948m) 07:00hrs. Day 12: Lobuche - Kalapatthar (5545m) - Gorakshep (5100m) 05:00hrs. Day 13: Gorakhsep - Everest Base Camp (5357m) - Lobuche 07:00hrs. Day 18: Lukla - Kathmandu (1310m) fly 30 minutes. Day 19: Departure transfer to onward destination. The Everest base camp, the main camp for Mountaineers, has the beautiful snowy mountains all around making the lifetime memory in our travel history. The exiting route follows the Khumbu Glacier and its interesting 15 meters high sera’s of ice making a unique feature of Himalayan glaciers.